Welcome to your dose of DIY fun! The PharMA-Your dose of DIY! This post may contain affiliate links that could pay a small commission. Print up your labels, cover existing Tic Tac label, and write names on top–check your list twice! Enjoy all the chuckles when passing these guys out! More holiday projects to come (as well as printables)! 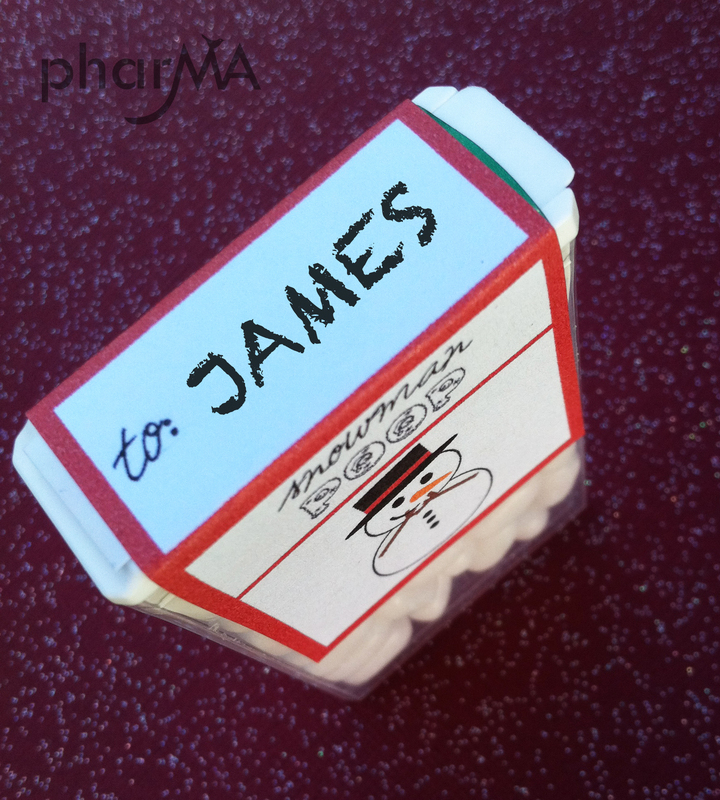 And since it is the season of giving (and I am not too proud to beg) please, please “like” The PharMA Blog on Facebook! Sign-up here for your home delivery DIY Dose Rx in your inbox! I can’t get the labels to pull up to be able to print them :-( any ideas? Hi Karn! So sorry—the link is now working!!! Please let me know if you have any other difficulties. :) Thanks for stopping by! Thats AWESOME, thank you! I’m excited to make some, they are adorable. Is there any way to print the labels without subscribing to scribd? It won’t download without it accessing my FB info either. these are so cute!!! I am definitely making these! Love this idea!! I was looking for something quick,fast & fun!!!! What size of labels should I buy? Wow!!! I’m overwhelmed with how much everyone likes my “Snowman Poop”! :) Crysta: I used the full sheet Avery Labels and cut out around my template for each tic tac label. Here’s a link (I’m pretty sure they are available in WalMart or and office supply store)http://www.avery.com/avery/en_us/Products/Labels/Addressing-Labels/Color-Prin…Virginia: I would love to email the file to you…please email me ma@phar-ma.com and I’ll get them over to you right away!!! Hope everyone is enjoying their weekend!!!! hilarious! definitely will be printing for stocking stuffers. thanks for creating! What a wonderful idea you had! Love them! I was wanting to use them for my Girl Scouts this year but can’t print them through facebook. Would you mind e-mailing them to me? I’d really appreciate it, but if you’re too busy I certainly understand :-) Thanks! Love this project, but I am unable to print them through facebook. When you get a chance would you please email it to me? Thanks! Can’t wait to hand these out! Thanks again for all the wonderful feedback! Here is the link again to download for those who need it:http://www.scribd.com/doc/74181661/Snowman-PoopIf you are still having problems (Crysta, RosieB, and Tracy) Please email me atma@phar-ma.com and I will respond back with the attachment (I don’t have your email from your comments) Hope this helps! Thank you again for stopping by my blog!!! you should submit this Craftgawker. I think a lot of folks would enjoy it! This are so cute!! Just wondering do you have these available for regular sized Tic Tacs also, as here in Greece we can’t get the Jumbo sized ones? I can’t get the link to work. Help!!! Ruth– Thank you for the suggestion! I went ahead and put it up on craftgawker! :)Samantha- Unfortunately, I do not have the label made for regular sized tic tacs but I think the label may still work–just hang down a little further?Teri–Please email me ma@phar-ma.com and I will send you an attachment!Thank you again everyone for the comments!!! These are fantastic! Thanks for sharing! What type of labels do you use to print on??? Hi Raina! I used the full sheet mailing label and then cut each one out. You could also use full size sticker sheet;) have fun! Welcome to my little corner of cyberspace! I love momming, crafting, DIY-ing, laughing, designing, blogging, drawing, acting, organizing, Pinterest-ing, Dubsmash-ing, and hearing from you of course! Follow along for your dose of all the PharMA fun! Sign up here for your dose of fun!